This year is the third International Year of the Reef (IYOR). This special designation offers the opportunity to reach out and form new partnerships with governments, businesses and communities who want to participate. In the Green Fins “Alternatives to Anchoring” how-to video you can find some inspiration for different situations. These include mooring to a pier, drifting, and installing permanent mooring lines on the beach. 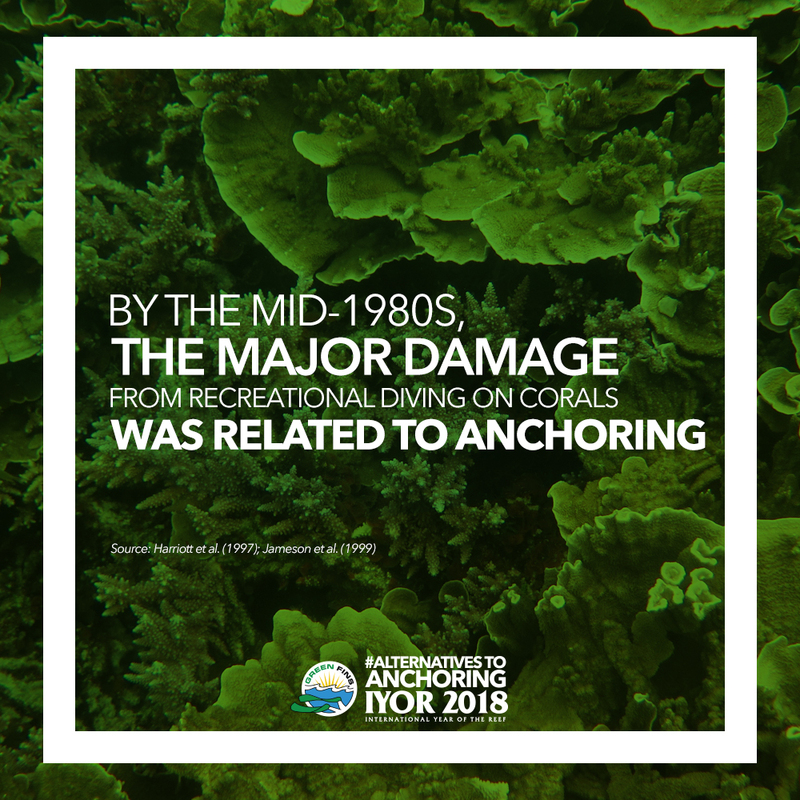 Alternatives to Anchoring is the second action point of the Green Fins IYOR 2018 social-media campaign. The campaign aims to help divers and dive businesses take further action by sharing and providing solutions to some of the biggest threats. The campaign will serve as a platform to inspire action and change in others by sharing the stories of success gathered by more than 10 years of working with the industry. Environmental standards vary widely across the world and within the dive industry. A small boat anchor, consequently, can cause a devastating amount of damage, destroying decades of coral growth. Research finds that anchors and their chains can damage an average of 7.11% of coral at a frequently used site each year. Damage occurs in the form of physical breakage, scratches, dislodgement and pulverizing the substrate. Hard corals are obvious victims, but studies show that soft-coral cover is also lower at high anchoring intensity sites. Anchoring grossly impacts the quality of the coral reef as a habitat and its structural complexity. This means it houses a lower variety and volume of marine species. This, in turn, leads to a degraded aesthetic value for tourists, poorer fisheries and reduced coastal protection. Furthermore, a reef subject to these kinds of stressors will be less resilient to the large-scale changes like acidification and coral bleaching. Luckily, several more-environmentally friendly alternatives exist, depending on the specific situation. The Green Fins initiative has been working with the diving industry to achieve best environmental practices since 2004, and the one common link the teams have found among different diving locations is that there’s no one answer. Across all locations, collaboration between dive shops, governments, and community has worked. It isn’t easy to lobby the government or navigate the social and political relationships between businesses. But it’s worth considering the return on investment. Nature and adventure-based tourism may outperform mass tourism by an average of 60% to 65% by 2035 in the Coral Triangle alone. As this tourism sector grows, maintaining a variety of healthy, diverse reef dive sites therefore becomes a worthwhile investment. Many environmental issues impact reefs and certainly there are far bigger threats than running a dive shop. But by reducing the impacts we can control, we leave reefs stronger to face those global threats.